As you probably know, I’ve been re-running some of my fun non-computer posts from the last decade. This Friday I’m going to rerun my post on the impracticalities of large-scale coilguns, and I thought that as a precursor to that I might talk a bit about tabletop coilguns. So, no programming language design this week. A couple years ago my friend Morgan expressed an interest in learning about electronics so I thought that a homemade coilgun would of course be a perfect gift for a ten year old. Yes, I am that awesome avuncular figure who gets kids pocket knives and drum sets and coilguns for their birthdays. Parents, you’re welcome! This is a great project to teach kids about circuits because it has all of the basic parts except transistors, and each part has a clear purpose. I’ve deliberately left the voltages, capacitances, resistances and inductances I chose off the circuit diagram above. Better to work them out for yourselves on the basis of what kinds of voltages sources and what capacitors you’ve got available, and what your appetite for destruction is. Going from left to right we see the four basic subsystems of a single-stage coilgun. On the far left we have a source of charge, say, a battery. Or several batteries; remember, batteries wired in series add their voltages. Batteries store a large amount of charge and release it slowly, which is exactly the opposite of what we want for a coilgun. If you were really fancy and had high-voltage capacitors you could build a system with some diodes to use wall power, or build yourself a voltage multiplier. But for now, let’s just say that you’ve got some battery-like source of DC power. Next to the battery we have the capacitor bank. Capacitors store a small amount of charge and release it very quickly, which makes them ideal for small coil guns. If you have multiple capacitors, remember that capacitances add when wired in parallel, not in series. And make sure the voltage applied to the capacitor bank is below the lowest safe working voltage if the capacitors have different voltage ratings. Beside the capacitor bank is the capacitor safety system. Capacitors are usually by far the most dangerous components in any circuit, and so I felt that it would be wise to build a safety system in, particularly since it would be used by a ten year old. There are two main safety concerns. The first is accidentally discharging a correctly-charged capacitor through a person. There is no way to look at a correctly-charged capacitor and tell if it is charged or discharged, so I’ve put a “bleeder” circuit with a green LED and a resistor across the capacitor bank. This has two benefits: first, it will slowly discharge the capacitor if you charge it but then forget to fire, and second, if the light is green then you know that the cap is correctly charged. Choose the resistor carefully so that the resistance is high enough to keep the LED from burning out and low enough to keep it lit. And of course, if you are getting your capacitors by ransacking abandoned CRT television sets, make sure that the capacitors are discharged before you reach in with the wire cutters. Capacitors can hold a charge for a long time. 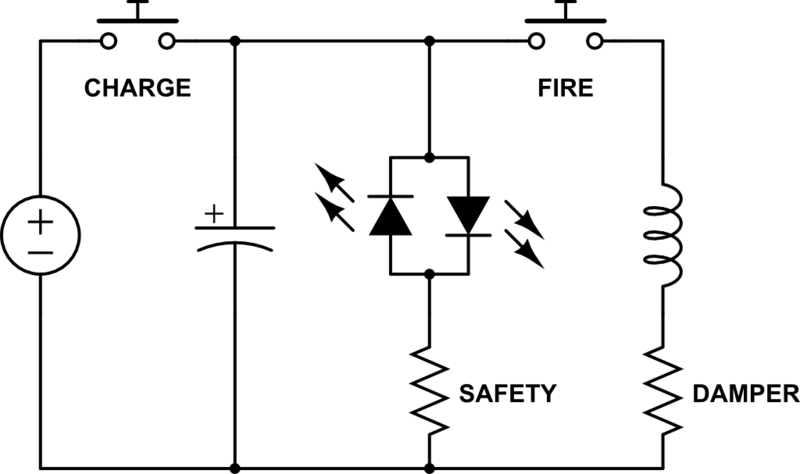 The second safety concern with capacitors is that most commonly available electrolytic capacitors can only be safely charged in “one direction”; you’ll notice on the circuit diagram that the positive terminal of the battery connects to the positive terminal of the capacitor. Electrolytic capacitors can be safely charged to their maximum rated voltage in the correct direction, but only a small fraction of that in the incorrect direction. So I’ve put a red LED in the circuit that goes the opposite direction as the green LED; if the red LED is lit then you’ve put the battery in backwards and are charging the capacitor the wrong way. If you ever notice that an electrolytic capacitor looks “bulgy”, it has likely been charged the wrong way at some point in the past and the fluid inside has expanded and deformed the interior. It is not safe to use; discharge it safely and discard it. Finally on the right we have the business end: the inductor. The inductor is a tube — maybe a drinking straw — with a coil of wire wrapped around the middle of it. The projectile — say, a small nail — goes in one end of the tube. The first pushbutton switch charges the capacitor bank, and then the second discharges the capacitor into the inductor. The coil of wire induces a magnetic field which accelerates the projectile towards the center of the tube, and of course it keeps on going out the other end. Wear safety goggles when firing your homemade nailgun. The design of the inductor is probably the best way to get kids involved in the experiment. Does it matter how many coils of wire you put in? How many is too many? How many is too few? Should the coils be all bunched together in the middle of the tube, or spread out along the whole tube? Which arrangement shoots the nail the farthest? Remember, it’s not science untilyou publish your results. It doesn’t have to be in a peer-reviewed journal. The fridge will do. The resistor marked “DAMPER” in the firing portion of the circuit is not necessary if the capacitance and inductance are relatively small. Any circuit that contains both a capacitor and an inductor can experience an “oscillation” behavior. Think of the capacitor-inductor system as two springs connected by a rod. The battery compresses the capacitor spring with the rod held fixed. Then when the rod is released — the firing switch is triggered — the capacitor spring moves the rod, compressing the inductor spring. Doing so flings the projectile sitting on the inductor spring, so some of the energy of the system is transferred into the projectile. But not all of it; there’s still energy in the inductor spring, and that can be transferred by the rod back into the capacitor spring. If the springs are really “springy” and there’s very little friction in the system, they can bounce each other around for quite some time, which is not desirable behaviour. The resistor adds a tiny amount of friction to the system so that rather than the inductor pushing energy back into the capacitor when the magnetic field collapses, the whole system just settles down to equilibrium quickly. This awesome page shows you the math. If you remember your damped-driven-oscillator math from first-year university physics, you’ll find that it is pretty much the same whether the oscillator is a spring or an inductor. So there you go; that’s an extremely brief guide to the absolute basics of coilgun design; enough to get your ten-year-old started on shooting nails at least. For a far more in-depth guide to the theory and practice of home-built coilgun design, see Barry’s Coilgun Designs; these pages were very helpful when I was putting together this toy project. Next time on FAIC: A rerun from the early days describing why coil guns don’t scale up to massive projectiles like rockets. This entry was posted in Non-computer and tagged coilgun by ericlippert. Bookmark the permalink. Some years back I shared a house with a 1-farad capacitor. We often used it for this. It made a really nice coilgun. But after discharging, we had to bolt a “keeper” across the terminals, lest it recharge from static. I prefer to refer to those as “ONE MILLION μF” capacitors. It sounds more impressive. If impressiveness is what you’re after, you could go further and say it’s a 1 Billion nF capacitor? or a 1 trillion pF capacitor, or further. But yes, a 1 μF capacitor is a common capacitor size. So, 1 million is actually representative of how much bigger it actually is, but they do also make capacitors in the pF range. Although I’ve personally never seen a capacitor in the femto- range.